Your partner in field preparation with everything from paint to machines, stencils to field covers. We have what you need to make your mark. An NFL caliber synthetic turf field paint is available for your field. Make marking easy! Try our soccer field layout tool and easy to use marking products such as the Eazy Crease marking kit. Free Liner-X Marking Machine with the purchase of 60 cases of Ameri-Stripe Paint. From sideline numbers or hash-marks, to end-zone letters or your own custom logo, we are your source for field stencils! From our free resources to our time-saving products and FAQ's, we work hard so you don't have to. You work hard to play at your highest level and we believe you should have an athletic field that does more than provide a surface. A place of pride and inspiration for your team, your fans and your community. We’re committed to providing the highest quality sports field marking products to help you play at your highest level. We specialize in custom field logo stencils, field marking machines, aerosol and bulk paint as well as windscreens, field tarps and turf or track protectors. In addition to our large selection of products Trumark focuses our efforts on a one-on-one personalized customer service experience. We work hard because we know you work harder. Let us help you select the right field marking machine for the job! Whether you are lining a soccer field, football field or even a parking lot, we can help you identify the brand and the machine that fits your needs. 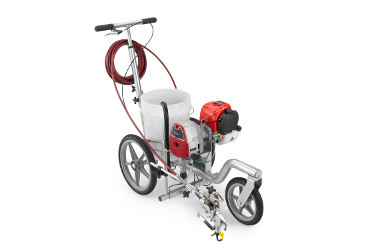 We have aerosol marking machines as well as bulk paint line stripers, all with unique features that can help you save time painting your field. Show off your team’s pride and play inspired! We custom manufacture sports field stencils. Whether you need a midfield logo of your mascot, your schools name painted in the end zone, or your corporate sponsors logo on the field we can advise, design and create the stencil that will make your field shine. We offer both flexible and rigid plastic for the stencils so that we can help you choose the product to get the best result. In addition to custom stencils we also offer the basics such as sideline number sets and hash mark stencils. Preserve and Protect Your Players and Field! We offer windscreens for tennis courts, baseball fields or any chain link fence. Mound covers and home plate tarps will protect your baseball field from the elements. We offer padding to protect your players from walls, fences, rails and backstops. Finally, protect your turf or track with tarps designed to withstand even the toughest traffic and weather. You can even add your logo or team name to the windscreen, padding, tarps or track and turf protectors to amp up the aesthetics. Looking for the most convenient way to line your field? Aerosol marking paint is probably your best bet. We offer a few different brands so we can help you identify the right product whether you are playing a pick-up game in the backyard or playing under the lights on Friday night. 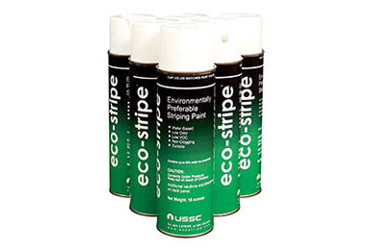 Aerosol field paint comes in white or multiple colors. We even have an aerosol chalk if you are looking for a temporary option. Whether you are playing on a natural grass field or synthetic turf field, we can help you find the right paint for the job. Bulk paint comes in 5 gallon buckets or in concentrated boxes. We offer numerous brands of bulk white and colored field paint regardless if you are playing in a rec league or an NFL game on Monday night. Looking to save time striping your field? Our field marking equipment is here to help. Use marking whiskers to mark your intersections so you don’t have to re-measure every time you need to paint. Our string winders are sure to save time with an easy wind feature that attaches to your cordless drill. 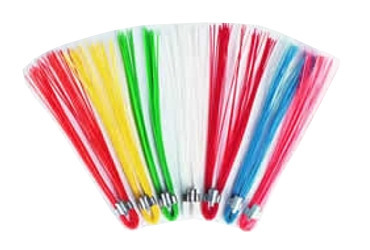 We even have products that will help you stripe the field without ever measuring again.